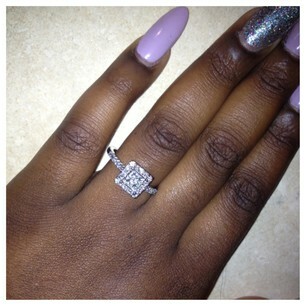 NaturallyKandiilicious: My Finger Is "Iced Out"!! ...On August 24th, Daren, my boo/best friend got down on 1 knee, asked me to be his wife and "Iced Out" my left ring finger with a gorgeous ring! Even though I have been expecting this for so long, I was so excited and surprised. I even was over come with a ridiculous amount of emotion! Tears everywhere! Who knew Faith cried??! Crazy I know! I can't wait to marry my best friend! I love that man so much!! With that said there is a lot of planning that must be done so I will be missing in action for some time but I still plan on sharing some of my wedding DIY since I am so frugal with my $ and I also will be working on our wedding site. Once its up and running I will share the link. I also plan on sharing my proposal story once I get time. Everything else related to the events of the wedding will be on our site. I have a wonderful hair interview coming later this week with a good friend of mine so stay tuned!